Practice Area: Driving range with grass tees, a putting green near #1 tee and a putting/chipping green near #10 tee. 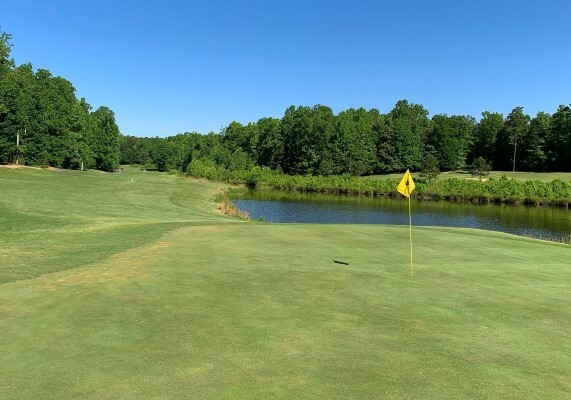 Description: This course is located just 5 minutes off I-85 near the University area. It features elevated tees and greens with many hills and rolling fairways. Notes: Several different monthly memberships available, including reciprocity at The Divide, Highland Creek, and Waterford. B-Man's Take: This course doesn't offer many surprises. It's pretty much straightforward. The holes get tough mostly because of some large, severely sloped, elevated greens and too much brush in the woods causing balls to get lost. It does have 3 sets of Men's tees, ranging from 6100 yards to almost 7000. The forward White tees at 6121 yds offer plenty of challenge even with several par 4's under 340 and all four par 5's under 500. From any tee, the 528 yard par 5 3rd hole will be tough, with a ditch to carry for your second shot that turns uphill and to the right. The green was the toughest on the course -- a large, severely sloped dome. I like the 547 yard par 5 14th hole, which gives you a chance to reach in 2. All-in-all, a fun course to play.